Brazil meets USA, big time! 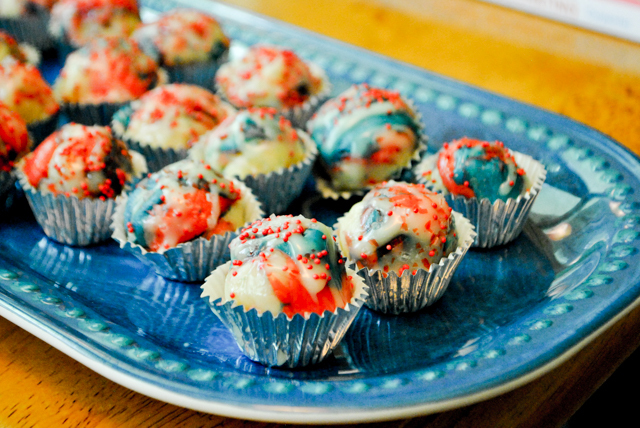 A traditional Brazilian delicacy dresses up in American colors for one of the biggest holidays celebrated here, Independence Day. We were invited for dinner and fireworks over at a friend’s home, and on a last-minute move, I prepared these babies to take with us. 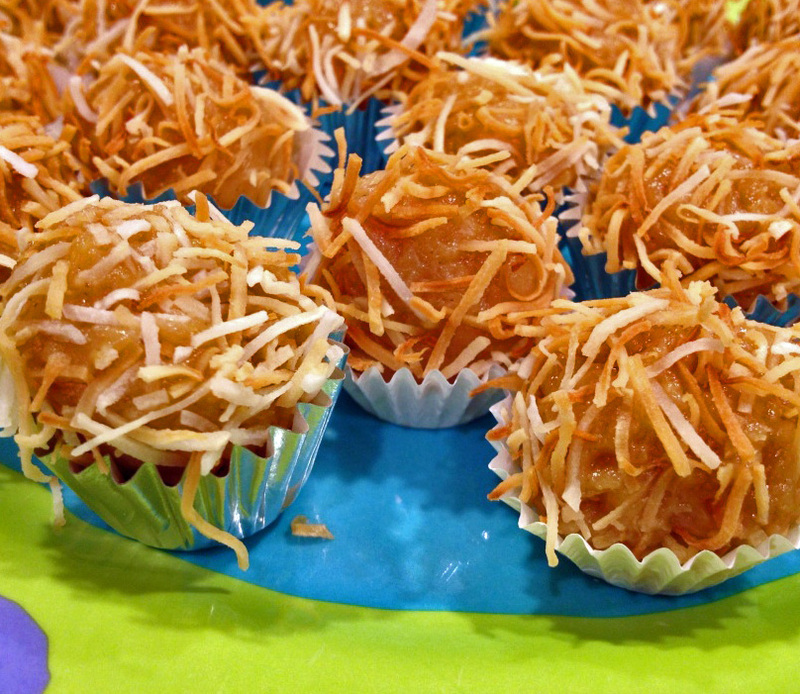 They are a departure of the classic Brazilian brigadeiros, made with cocoa powder. In this case, I flavored them with a touch of coconut extract, but probably should have added more than I did, the flavor was barely noticeable. Combine sweetened condensed milk with unsalted butter in a wide, no stick pan over medium heat. Cook, stirring constantly, until smooth. Mixture is ready when it thickens and starts to peel away or show the bottom of the pan when you scrape it with your wood spoon (about 10-15 minutes). The fudge mixture should be thick enough to reveal the bottom of the pan for a couple of seconds before the mixture levels out again. When the fudge mixture is ready, remove from the stove top and stir in the vanilla or coconut extract. Next, spread 1/3 of the mixture in the center of a half-sheet pan coated with a little butter so that it won’t stick. Place another 1/3 of the mixture in a bowl and stir in blue food coloring. Place the remaining 1/3 of the fudge mixture in another bowl and stir in red food coloring. 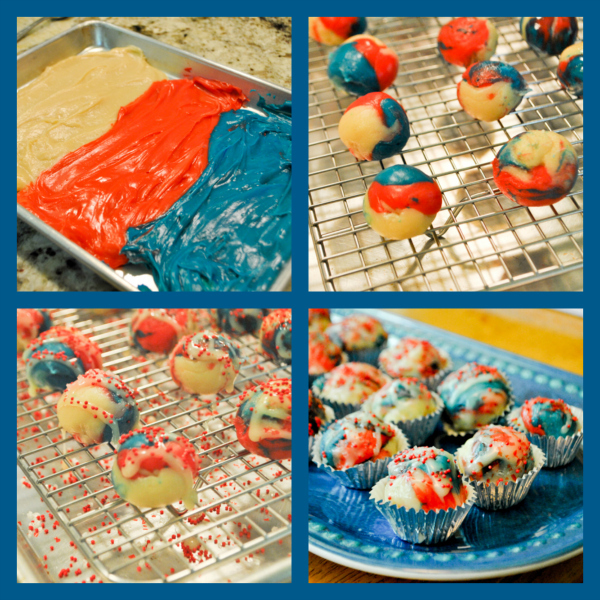 Transfer both the blue and red mixtures to the greased baking sheet, spreading them around side by side. Allow to cool completely. Using a tablespoon as measurement, scoop out one spoon of the white/red/blue mixture (starting from the center to the edge of the plate) and with greased hands, roll out into balls. Place each little ball into a small paper liner and decorate the way you want. They can be kept in the fridge until serving time. Comments: If you’ve never made traditional brigadeiros, or worse yet – have not even heard about them, please read my old blog post to fix this major gap in your culinary knowledge. It’s important. 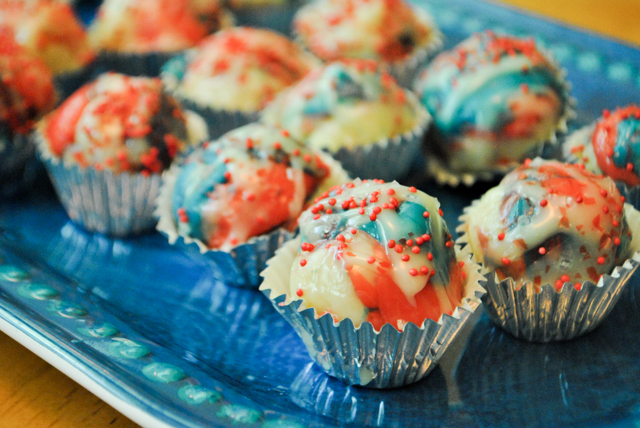 It was really fun to make these, I advise you to use two cans of condensed milk, so that you have enough to play with. With this amount, I made 26 brigadeiros. They are rich and sweet, so one or two is all you’ll need. But they bring me so many nice memories of my home country, I usually have a bit of a hard time stopping at two. So I accept my weakness, and move on. And jog on. Weight lift on. Kickbox on… you get the picture… damage control. You can definitely use different colors to celebrate your favorite team, your school, your mood. Halloween Black and Orange brigadeiros might be the rage this year (wink, wink). SIX YEARS AGO: Amazing Ribs for the 4th of July! Those of you who do not know what is a “brigadeiro” are invited to jump here and read a post I made a couple of years ago. It explains everything you need to know about the most traditional sweet served at Brazilians parties and kids’ birthdays (particularly kids younger than 91 years old). 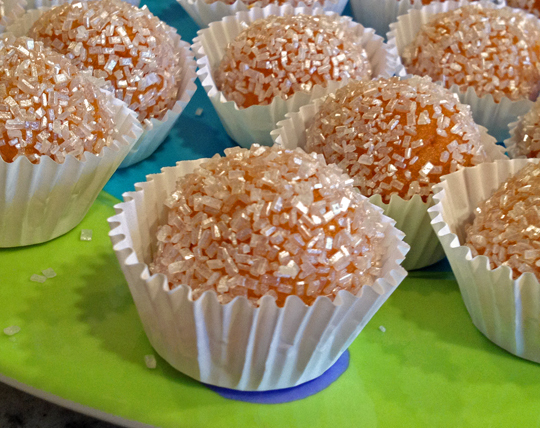 Coconut brigadeiros are simply a variation on a classic, but wow… they ARE ridiculously good. Make a batch. And you will be hooked. Add the condensed milk, coconut milk, unsalted butter, corn syrup, and 1/2 cup of shredded coconut to a heavy saucepan and bring to a boil over medium heat. Turn the heat down to medium low and cook, stirring constantly with a wooden spoon, until the mixture thickens. Depending on your stove, it should take 15 minutes or a little more. If the mixture boils too furiously, lower the heat. Keep stirring at all times or you might end up with brigadeiros that are not totally smooth. The mixture is ready when you can see the bottom of the saucepan as you stir. Slide the mixture out into a bowl, avoid scraping the stuff that glued to the pan. Let the mixture cool completely or until it is cool enough to handle. 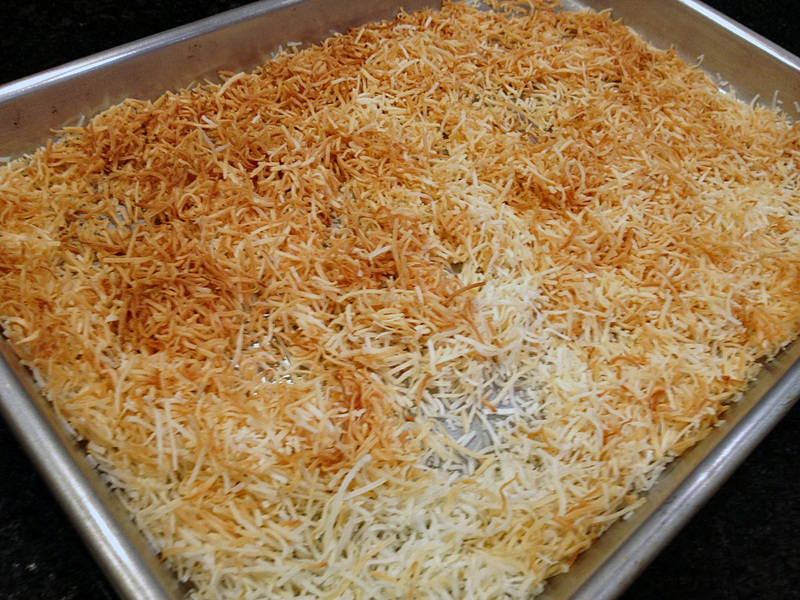 Spread the remaining 1 + 1/2 cups of the shredded coconut out onto a rimmed baking sheet and toast in a 350 degree oven for 10-15 minutes, stirring every 5 minutes to ensure even browning. Remove from the oven when most of the coconut is golden brown. Place into a bowl and let cool. Scoop the coconut mixture with a small spoon (it helps to wet the palm of your hand with cold water) and roll into 3/4″ diameter balls. 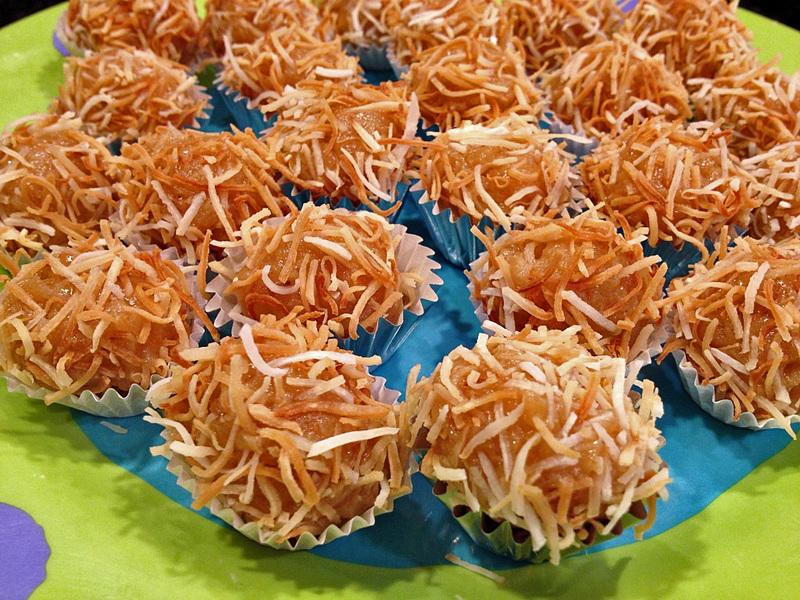 Drop each ball into the shredded coconut and toss gently to coat. Serve right away at room temperature, or chill until ready to serve. 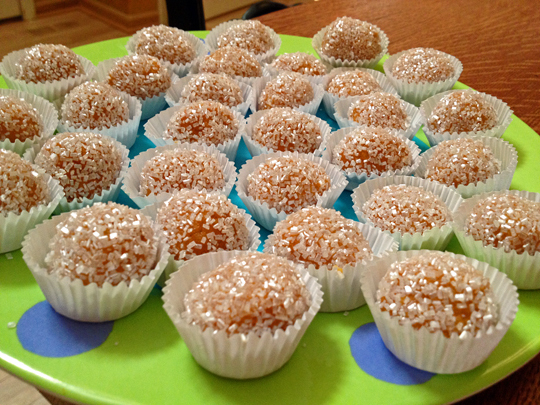 This recipe will make 26 to 36 brigadeiros. I tend to like them a little bigger, so I normally end with less than 30. The recipe can be doubled. 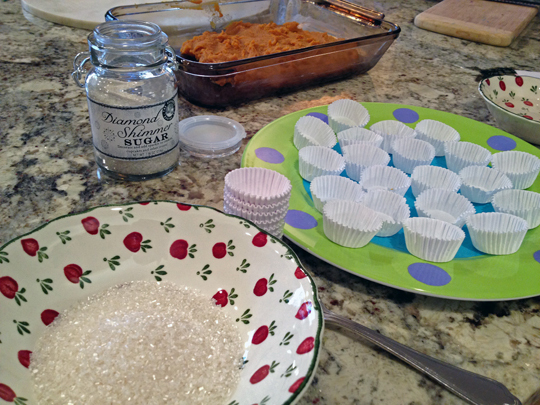 For a different take, roll the coconut brigadeiros in chocolate sprinkles. Comments: A friend of mine from Brazil goes to the extent of sautéing the shredded coconut in butter for the coating. I think toasting in the oven is good enough. Sometimes you can find shredded coconut in smaller pieces than the ones I used. It will work fine too. 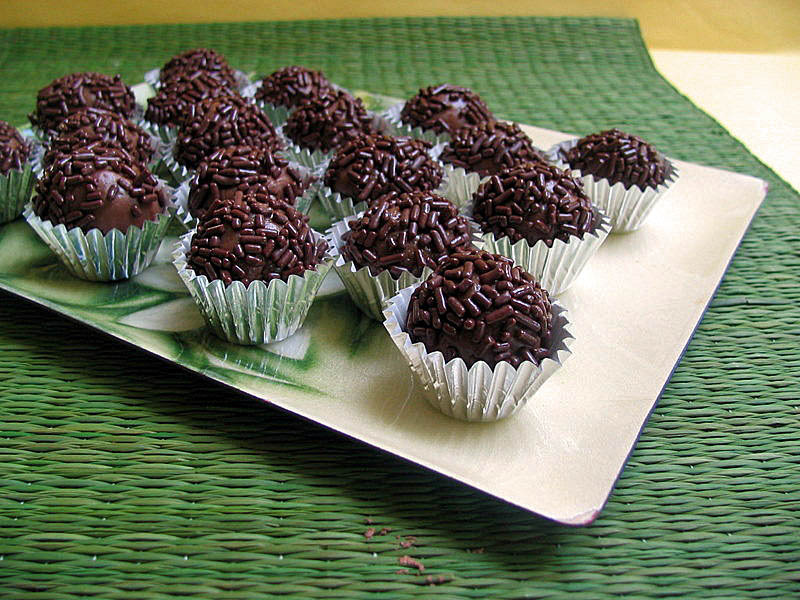 Brigadeiros can be served at room temperature, or straight from the fridge. They will have a different texture, some people (me included) prefer the soft, room temperature version. While we were in Brazil a couple of months ago, my niece Raquel served us a variation on brigadeiros that might very well be my favorite: brigadeiros de cupuaçú. Love Brazilian cooking? Consider getting Leticia Schwartz book, The Brazilian Kitchen. For my review of her book, click here.